Wave, one of the industry’s premier smart grid technology solutions, is based on a distributed control strategy that makes it easy to integrate any type of distributed energy resource (generation, storage or loads), visualize and monitor assets, and optimally dispatch them for different applications. Dispatch can be carried out manually, scheduled ahead of time, or performed automatically to meet specific objectives. Electric Utilities use Wave DERMS in concert with existing back-end systems such as SCADA, DMS, OMS and AMI to transform distributed resources such as electric vehicles and renewable energy, that are potentially disruptive to normal grid operations, into supportive assets used to strengthen grid operations and to deliver new energy services to customers and energy markets. 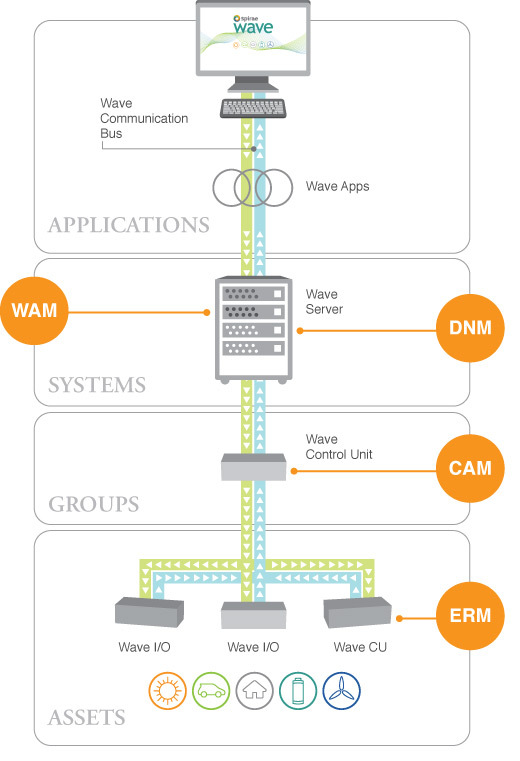 Wave® Apps are managed by the Wave Application Manager (WAM). Wave Apps are extensions to Wave® that add business logic to meet user-specific objectives. System-level objectives are carried out by the Distribution Network Manager (DNM). The DNM stores the full representation of the DER portfolio including assets, connectivity, and capabilities of the overall system. Groups of Assets are hosted and managed by Control Area Managers (CAM). Groups give Spirae Wave the ability to aggregate DER into dynamic portfolios assignable to different system capabilities. An Asset is any distributed energy resource that Spirae Wave needs to know about in order to manage the system under its control. Assets are hosted by Energy Resource Managers (ERM). Spirae Wave uses a standardized catalog of assets to easily interface with and manage assets. Spirae Wave’s software processes communicate via a dedicated bus called the Wave Communications Bus (WCB) that manages the transport of time-sensitive data.